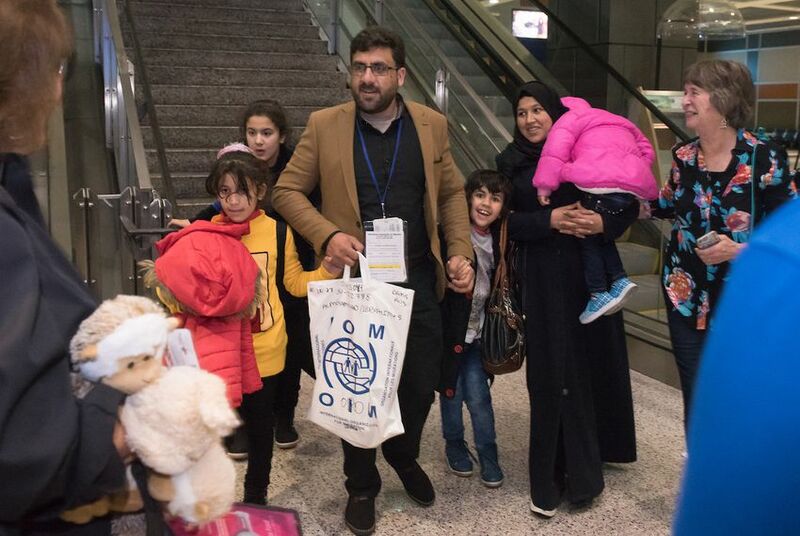 For all it had taken them to get to the United States, Ibrahim Almohammad, his wife and their four young daughters took their time as they walked into their new life. Visibly apprehensive, the Syrian refugee family slowly took the stairs instead of the escalators down into the arrivals hall of Austin-Bergstrom International Airport late Monday night, nervously glancing down at about 20 strangers who greeted them with smiles and “Welcome to Texas” signs. 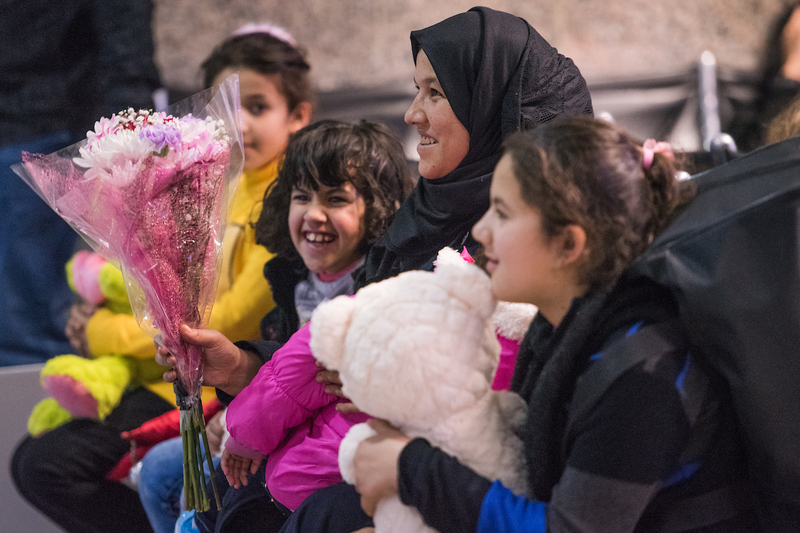 “Everything is going to be fine,” one of the greeters, a refugee herself, assured them in Arabic as some of the volunteers handed the girls a bouquet of white daisies and an assortment of stuffed animals. Others broke into applause to celebrate the refugees’ arrival. By then, the newcomers were smiling back. While her two older sisters were shyer, the 7-year-old Syrian girl — the family’s second-youngest — looked up in wonder as the parishioners of St. Michael’s Episcopal Church protectively surrounded the family. When she reached out to touch hands with the volunteers there to greet them, there appeared to be little understanding in her big, brown eyes that just a week ago, this country had closed the door to refugees like her over security concerns. Her family appeared unaware that they had arrived in a state where the governor fought unsuccessfully for almost a year to keep people like them out. It didn’t seem to matter that they would start a new life in a county where the new president later accomplished — temporarily — what the governor couldn’t. On Monday night, all that seemed to matter to the refugee family and their new friends was that they had made it to their new home. Speaking through an interpreter outside of the baggage claim area, Ibrahim Almohammad quietly explained that the family had been nervous about their travel arrangements. He still wore a lanyard around his neck with a placard that listed his information so he could be identified if the family got lost at the airport. 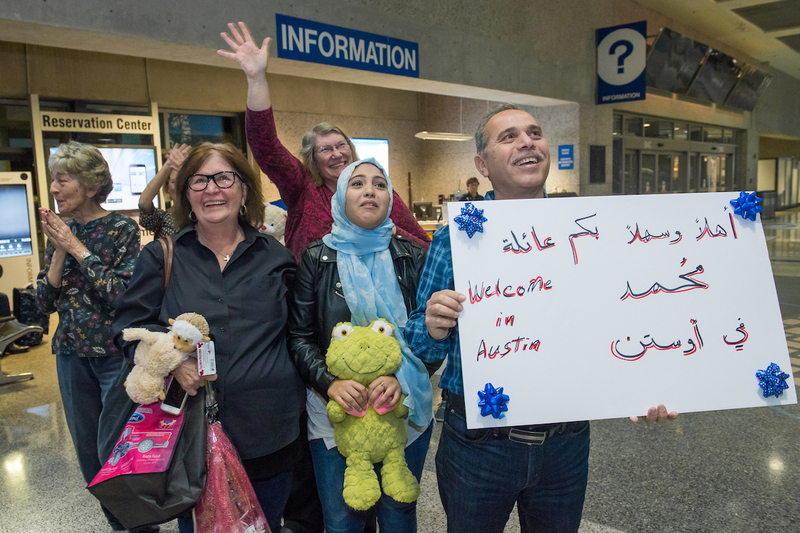 But now that they had arrived in Austin from Jordan, he described how he was feeling with just one word: "excellent." A week ago, the Rev. Sherry Vaughan Williams — among those leading the west Austin church’s volunteer resettlement efforts along with Refugee Services of Texas — was worried sick about what would happen to the refugee family that her congregation was assigned to help start new lives in their community. "Most people don't understand how all of this works," Vaughan Williams said of the complexities that come with refugee resettlement. The Almohammads were originally scheduled to arrive last week, but their flight was canceled after President Donald Trump signed an executive order to ban the entry of individuals from seven predominantly Muslim countries, stop refugee admissions to the U.S. for 120 days and halt the resettlement of Syrian refugees indefinitely. The family was among more than a thousand refugees whose hopes last week of starting new lives in the United States were dashed with the stroke of a pen an ocean away. The canceled arrivals were limited to refugees from Iraq, Syria, Iran, Sudan, Libya, Somalia and Yemen. Because they were considered to be “in transit” and had already been cleared for resettlement before the 120-day shutdown took effect, a few dozen refugees from places such as Afghanistan, Eritrea, Rwanda and the Democratic Republic of Congo were allowed to board their flights to Texas last week. Some of them were family units. Others were arriving on their own, hoping to reunite with family members already in the state. “But our family is not arriving,” Vaughan Williams said last week in a resigned tone. As those refugees landed at airports in the state’s metropolitan areas as late as last Thursday, they were thought to be the last families that would get to start over in Texas for at least four months. But distress turned to relief when a federal judge in Washington temporarily blocked enforcement of Trump’s ban nationwide on Friday. Resettlement officials went to work rescheduling flights for the Almohammad family and others. On Monday morning, Vaughan Williams read the email alerting her of their rescheduled arrival and quickly called parishioners into action. 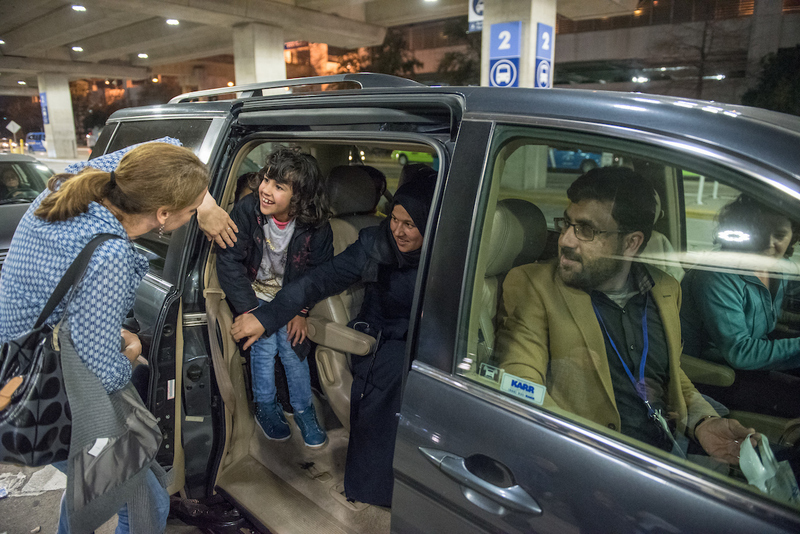 There were beds to be made and a kitchen to be stocked — and they had less than a day before the Almohammad family was expected to land in Austin late Monday night on the last connection from Chicago. "It was such great joy," Vaughan Williams said about the moment she read the email. "I had a sneaky feeling it would be OK."
By Monday night, as Vaughan Williams waited at the airport with the other volunteers, her concerns were much different and significantly more light-hearted. She was unsure if the little girls would be able to sleep in their beds at the modest apartment that was waiting for them a few miles away — the volunteers had received so many donations from their fellow parishioners that the girls’ beds were almost covered in stuffed animals and toys. It’s unknown how long Trump’s refugee ban will remain on hold. A federal appeals court is set to hear arguments on Tuesday. The uncertainty of what could happen to the thousands of refugees that could be next in line to make it into the United States hung over the emotion the volunteers were struggling to contain while waiting for the Almohammads to arrive Monday night. “It’s like a miracle,” said Rhoda Silverberg, one of the first parishioners to arrive at the airport. The Almohammads’ rescheduled arrival offered the volunteers a flicker of solace as they exchanged concerns about the temporary hold on the ban and about how grateful they were that their family had made it in. Most of them had spent the day repurchasing items for the family’s home that they had returned late last week when they thought there would be no use for them. Some of them had driven to the airport from the family’s apartment in North Austin, which they spent they day preparing. Dozens of congregation members had pitched in: setting up laundry baskets, arranging throw pillows, hanging up a shower curtain with bright blue circles. When word got out about the incoming family, neighbors started pulling things out of their garages to offer up as donations, one of the volunteers said. A 10-year-old congregant had gone through her own closet to find clothes to donate to the Syrian girls. Others had offered up cash and gift card donations. As volunteers loaded the family’s luggage into two cars, Ibrahim explained he was eager to get his children into school and go to work. Resettlement officials would soon come by the family's apartment to walk them through their new life. They would be taught how to ride the bus, and they’d be taken to the local social security office to obtain proper documentation. The parents would be enrolled in English classes and the little girls in public school. They would help them find jobs. But all that would come later. As the clock neared midnight, the volunteers’ mission was to get them to their new home a few miles away where another group of St. Michael’s congregants was waiting to greet them with a warm halal meal. The family piled into a dark minivan driven by one of the volunteers who earlier had been holding a welcome sign drawn in the messy writing of a child. The Almohammads’ youngest daughter — just 2 years old — had remained asleep for most of their arrival and was tucked in a car seat. The other three girls and their mother smiled at those standing on the curve from the back seat of the van. The 7-year-old excitedly waved goodbye and blew kisses even as the minivan sped off. For now, everything was going to be fine. President Donald Trump’s executive order restricting travel from seven predominantly Muslim countries and halting refugee admissions turned hope into heartache for the Texas volunteers looking to help refugees and left many refugee resettlement agencies wondering what was left of their mission. President Donald Trump’s executive order to restrict refugee admissions was expected to keep thousands of refugees from being resettled in Texas.